There was no set, neither were there costumes nor director, but make no mistake about it, the hottest night of opera on planet Earth last night took place in Boston, Massachusetts. I’d bet the farm on it. The Boston Symphony presented a concert performance of Richard Strauss and Hugo von Hofmannsthal groundbreaking 1909 opera, “Elektra,” and, over a century after its premiere, shows it still can make an effect on an audience that is rare in any opera house. 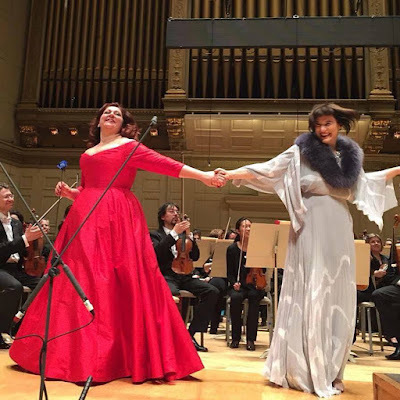 That this performance took place not in an opera house, but rather in Symphony Hall seemed almost to heighten that effect. While there was no platform for the singers to "act on" (and blessedly singing from memory) they "gave the play" on the limited space before Maestro Nelson's podium and his players, most with the skill of finely honed actors. 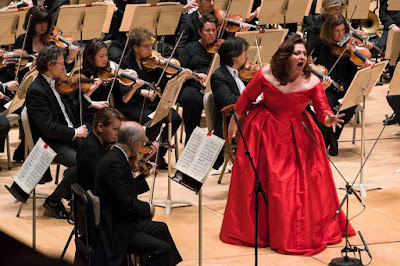 Strauss gave no mercy to his title character who is onstage for the entire evening, even during “breaks” from singing and in what may be considered by general operatic standards a rather short opera (under a pair of hours) he has gifted his heroine one of the most challenging, exhausting ... and ultimately rewarding roles in the dramatic soprano repertoire. Last night Christine Goerke faced those challenges, met those challenges and blew the roof off not only the hall, but of every audience member’s head. It was THAT kind of night. From her entrance from the audience, until her collapse of death, it was impossible to keep one’s eyes off the girl in the crimson gown. Goerke’s naturally electrifying radiance that, when matched with a voice of such power and command of her language created an Elektra that was never just pitiable or terrifying (though she certainly brought those elements to the forefront) but formidable, yet feminine. This unique take was established instantly during Elektra’s opening monologue, surely one of the greatest “entrance arias” in all of opera. During its roughly 10 minute length, the soprano never appeared to give less than everything she had, yet those accustomed to her performances feared not about what was left in the reserve tank for the rest of the evening. Indeed, at every climatic high note moment Goerke seemed to go for broke in a manner few Elektras are afforded or capable of. As sister Chrysothemis, Gun-Brit Barkmin could hardly have been more effective and played in contrast to Goerke’s Elektra. The voice, deceptively slender, is nonetheless capable of making mighty sounds and was, even decible-wise, easily up to the challenges of holding her own against her formidable sister. The two ladies played beautifully off each other and, coming together after learning the (false) news of their brother’s death, were jointly heartbreaking. Similarly their joy at the murder of mother and stepdad was explosive, effusive as the Tanglewood Chorus, joined in Strauss’ merry mayhem, whilst pouring out and singing from the doors of the hall’s second balcony. Amazing. Jane Henschel brought vocal glamor and rock solid musicianship as Klytemnestra. The long mother/daughter scene was, as it should be, the linchpin to the evening’s drama and while Henschel’s presence was more “stand here and sing” than the other characters, the scene was enormously effective, ending with her cackling laugh to destroy her daughter’s sense of having won the battle. As Orest, James Rutherford exhibited some of his mother’s stoic quality, which made his sister’s final recognition of him infinitely touching. It’s not a slap in the face, but in the longest male role of the opera, Orest is almost a prop (I know some baritones who will hate me for that) for Elektra to sound off of. Indeed, Strauss, here, gives his heroine the most beautiful music she will have all evening (one can hear strongly the Vier letze lieder which would come 40 years later). Though “unstaged” Ms. Goerke again proved to be in complete sympathy with her character and after a passionate embrace, moves away, staring at the hand that touched her brother, the image of him almost fading away as if a dream, while he was still there. It added something immeasurable and in a way, the gesture became part of the music. In supporting roles, Elizabeth Byrne, Nadine Secunde, Meredith Hansen, Nadezhda Serdyuk, Claudia Huckle, Mary Philips, Sandra Lopez, Rebecca Nash, Mark Showalter, and Kevin Langon all contributed enormously to the success of the performance. Andris Nelsons appeared, all night, to be dancing on the rarest of clouds. To be able to present this orchestra in this score and allowing Herr Strauss to “do his thing.” There were moments, rare as they were, where I wondered if he’d forgotten there was singers onstage having to compete with the sheer decibel strength the band was capable of putting out. He seemed to luxuriate in the knowledge that, at least with this present cast, he had to hold nothing back, and acted accordingly. The end result was the immediate explosion of sound from an audience who’d been held enraptured the past couple of hours. 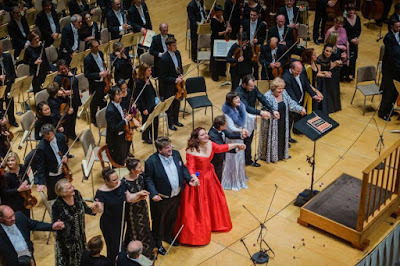 While standing ovations have become a norm for many performances these days, not many of them involve the entire audience and fewer still begin when the house collectively leaps to its feet while the final chord (and what a chord Strauss gives us) is still hanging in the air. The shouting and cheers went on for a good long while, few even daring to leave the hall. There was nowhere better to be than Boston last night. Anyone who can possibly make the next performances (Boston on Saturday, Carnegie Hall-NYC next Wednesday) would be foolish not to go. Seriously.